For several years now, Model-Based Testing is mainly used within the (technical) development processes. In the Black Box testing community it was still "just a theory", and in my case: fun to play with. Today is different! I'm completely into Model-Based Testing nowadays. MBT turned, for Black Box testers, into serious business! Model-Based Testing is software testing in which test cases are derived in whole or in part from a model that describes some (usually functional) aspects of the system under test (SUT). For quite some years I'm working with a tool called COVER. Initially COVER was build to help lazy testers, like me, to avoid boring manual activities�and it worked! Using this tool I could easily amaze my surrounding with stunning Speed and Quality. Especially deriving test cases from formal specifications like pseudo code or activity diagrams was fun to do; instead of "solving a boring puzzle" time, it was done in seconds (as a matter of speaking). However, most of the testers in my surrounding didn't recognize the ease of this way of working (or were not lazy enough?) so COVER didn't have much users. Today is different. The attention for Model-Based Testing is growing rapidly. Previously, when a project had to make test cases, it was accepted that it was done manually and, everybody knew, it should take quite some time. Today the budgets are lowered...What to do?...Less productivity? My suggestion: When you've less money to spent, be creative to get the same results! Model-Based Testing is a nice example of creative thinking! Within a few months the relatively unknown possibilities of Model-Based Testing tools became very popular for Black Box testers within Sogeti. Especially the collaboration-part (designers working together with testers) of Model-Based testing is an eye opener. Everybody knows that it is smart to find defects as early as possible, but it is very difficult to motivate teams to perform good design inspections. Now MBT tools like COVER can do a big part of those intensive inspections, because using the models for generating test cases will directly show the defects in those models in a very early phase of the project! And beside that, it generates a big part of the test cases! So, when the Designers create models that COVER understands, projects will perform Better, Faster and Cheaper! ....and it works! And maybe most important: We have proved to find defects much earlier than the project did manually! Collaboration will change the world of testers! Using MBT is in fact collaborating within the Application Lifecycle [ALM] supported by standardization and automation. Many defects, found in functional testing, have their origin in misinterpretations and assumptions of the requirements and/or specifications. The early usage (generating test cases) of formal models, just after or during the design phase, will create a much more solid base for software coding. For the testers this will mean less and less defects, so besides the generated test cases, the improved quality of the software will also fasten the test process. This industrialization can�t be stopped anymore. The time of creating most test cases by hand has had its peak. Of course, not all test cases can be generated, and also manual testing itself will never disappear, but handcrafted test cases will be less and less common practice. The work of Black Box testers will, in my opinion, shift in two directions: 1) Earlier in the life cycle: joined modeling and helping and supporting development to find defects as early as possible (Master Test Plan consultancy), or 2) the coming market End-to-End testing: the importance of complete chains of applications is growing rapidly. End-to-End Testing will become a separate specialism. Back to Model-Based Testing: To give an idea what type of models can be used, and how test cases are generated, I've made a some slides (with examples) about the Sogeti MBT tool: COVER. Look for yourself if MBT will affect your work! 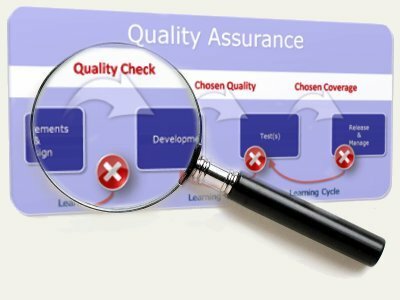 In this episode I will discuss the different practices around the Quality Check in order to do this important check for ALM as efficient and effective as possible. In the last episode Clemens talked about the support VSTS2010 will give on the collaboration at artifact level. Different roles in the lifecycle work together on artifacts. Each of them adds their knowledge, vision and ideas to the solution from their view point. These artifacts are accessible by every role in every phase of the project, adding value throughout the lifecycle. People are enabled to collaborate, making applications together, and not only by telling what they are doing but most important by working seamless together on the application. A subsequent measure for increasing the quality of the developed artifacts is an evaluation activity: for instance the review. The review is a method of improving the quality of an artifact by evaluating the work against the requirements and/or guidelines and subjecting it to peer review. The review on the requirements and/or design can be carried out as a static test activity before the coding starts. 1. Has the artifact been realized in accordance with the assignment? For example, are the requirements laid down in the technical design realized correctly, completely and demonstrably? 2. Does the artifact meet the following criteria: internally consistent, meeting standards and norms and representing the best possible solution? �Best possible solution� means the �best solution� that could be found within the given preconditions, such as time and finance. 3. Does the artifact contribute to the project and architecture aims? Is the artifact consistent with other, related artifacts (consistency across the board)? 4. Is the artifact suitable for use in the next phase of the development? "How many defects, detected in Acceptance Tests, could have been found much earlier, if we had done a Quality Check? (According to the above points)"
1. Performing a good Quality Check is a kind of inborn specialization. Find a person who is good in recognizing texts with high potential risk on assumptions and or interpretation errors. In other words: find a pencil-pushing, nit-picky quality geek! Most professional testers are proud to have these qualifications. 3. If a previous version of the artifact is available, and the quality of that version is known: make use of a so called Comparison Tool to find and check the differences. AND! Check always the consistency of the �change register�, especially when the �change register� is used in the next phase to implement the changes. 4. Combine the Quality Check with the estimation activity for the next phase. If the estimation is done by another person, let them work together! 5. Use a checklist as a reference! For your own protection, a checklist prevents that too much attention is paid to the use of standards and correct spelling or even to these aspects alone (This can be a cause of friction among the various people involved.) Partly owing to the diversity of design techniques and information sources that, it is not possible to create one general checklist per artifact type. Therefore, checklists should be created specific to the situation per organization and per project. Of course you can use examples like Testing Requirements or Testing Use Cases as a start for the creating of your checklist. 6. Make always clear what checks you will perform. By communicating your checklist you can prevent a lot of misunderstandings on later findings. 7. Audi alteram partem (hear the other side). Don't report on findings/defects without a fair hearing in which the author of the artifact is given the opportunity to respond to the "accusations" against his work. Wrong! Don�t be a Scrooge! (see my blog: "Does Scrooge exist?") An essential part of the Quality Check is the Learning Cycle. By performing Quality Checks the quality of future AUC�s (Artifacts Under Check) must grow. So collaborate with the designer, information analyst or whoever made that artifact, and get your applause on the better quality of artifacts instead on the number of defects. In the next episode Clemens will explain how the tools support the Quality Check, as well as the collaboration around it, to get the optimum results.